God will not share His glory with another but since He’s not around in a form where we can physically see Him, we’ll try to steal it. Like a child who can’t get enough attention, we take every opportunity to make ourselves the center of the world. Knowing that all glory belongs to God, knowing how to handle compliments is hard. And what is the difference between a compliment and a word of encouragement? In the past, admittedly, I had no clue how to step around this minefield. For a long time, I asked audiences to refrain from any applause when I sang. It made me uncomfortable. But I came to understand that audiences need to express themselves. They need the artist to know when something has touched them. Additionally, I also deflected every compliment and denied that what they were saying was true. This made the person who meant well feel like they were being corrected. Contrasting the two, here’s a compliment. “You are the best teacher I know.” And a word of encouragement. “I’m so grateful that you know your gift comes from God and you use it beautifully to make Him glorious.” The first builds the ego. The second encourages humility and faithfulness. In a ministry that has gotten a lot of personal feedback over the years, and as someone who has struggled with the platform, I want to be clear where God has me now. Jaime and I have had meaningful discussions about ‘gifts and service’ this week, so I am confident that I speak for both of us. When God shines His light on a passage and a devotional is born, to God be the glory. When someone feels that the devotional was written just for them, to God be the glory. When God gives grace to write something on a bad day and an empty page is filled, to God be the glory. When a heart is stilled and comforted by what was written that day, to God be the glory. When a ministry has been around for 3+ decades, to God be all glory. 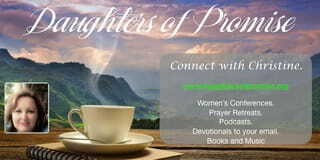 Pray for us ~ that Daughters of Promise would always be about God.